Adult and child alike are captivated by the Siberian’s childlike eagerness, stately beauty, and million dollar smile. 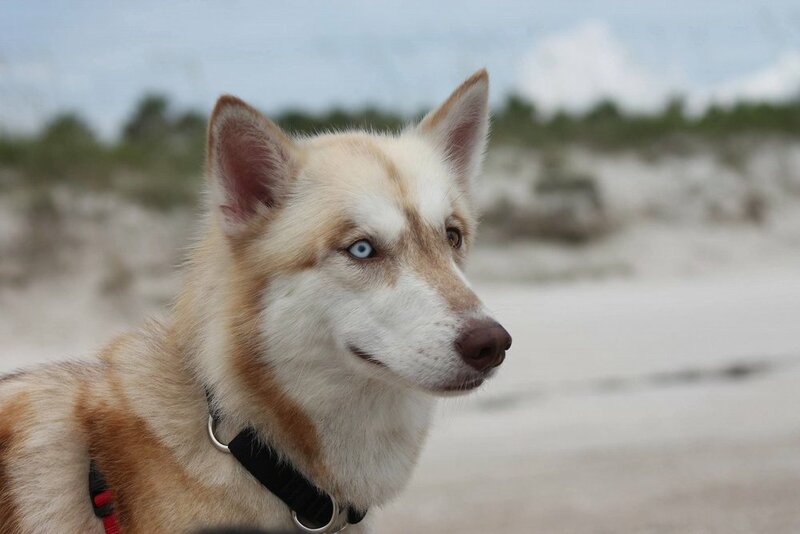 However, as appealing is the Siberian may be, it is not the breed for every dog owner. Too many Siberians have ended up lost, in dog shelters, under the wheel of a car, the neighborhood nuisance, or mistreated simply because the owner did not understand the breed. Take a close look at these traits–their advantages and disadvantages — then decide if this is the breed for you. One glimpse into a Siberian “crater” is enough to realize how efficient a hole digger the Siberian is. Of course true to the Siberian’s nature, he will choose when and where to dig. This can present a problem for many homeowners. Siberians who do have a place to dig seem more content and less destructive. The instinct to dig is ancient, and while it can be curbed to some extent, it will not be eliminated. Siberians will dig and chew, outside or inside! If left to roam freely in the house, the dog can turn a neat orderly home into a housekeeper’s nightmare. Digging through carpet or flooring has been known to happen. Crate training is suggested for dogs with an indoor digging tendency. The Siberian Husky rarely barks, preferring to whine or moan, and when the mood is right, with head held high, he will produce one of the most hauntingly beautiful sounds in nature: The Siberian Howl. While this sound may be music to the ears of a Siberian lover, neighbors have been known to feel otherwise. As a rule, the Siberian will not alert his owner when a stranger approaches. While the owner is not bothered with irritating barking every time someone enters his property, he is left without that added protection. Many Siberian kennels have another breed specifically for protection. Given proper training, the Siberian should be able to obey simple commands and act quite respectable–most of the time. Now we come to serious obedience training and the Siberian–something that non-Siberian obedience people call a contradiction in terms. This is an exaggeration, for the Siberian has the ability to perform admirably, and many have. As a breed, however, they do not excel in this area, and anyone wanting a dog solely for obedience work should not consider the Siberian. Siberian people who do pursue obedience titles tend to maintain a philosophical attitude towards the whole training process–perhaps because they, like their dogs, tend to be gregarious and well-behaved, but not always obedient enough for some. The Siberian can easily adjust to new environments. A nomad at heart, the Siberian has no fear of cars nor homing instincts compatible with our modern society, and once loose, he can easily fall prey to injury, disease, and hunger, or become a pest chasing and hunting small animals or digging in neighbors’ yards. Siberian owners quickly learn that, for the dog’s sake, it must be confined or kept on lead at all times. The inquisitive nature of the Siberian is one of the qualities owners find most endearing and challenging. Curiosity not only kills the cat, but a sizable number of Siberians as well. The desire to seek out that scent, to hunt, to chase, to discover the other side of the fence, is primitive, deeply inbred, and can become overwhelming at the most inappropriate moments. Ask any musher who has wrapped his/her sled around a tree because the team decided to take the “scenic” route. Originally bred to perform on a minimum amount of food, the Siberian requires less substance per pound than other breeds his size. Siberians need a balanced diet, high in protein and fat–especially during the winter months. Many commercial dog foods do not meet the dietary needs of the Siberian. Siberians are great escape artists, and even the best cared for, best kenneled Siberian may get loose, never to be seen again. They can crawl through microscopic holes, scale 5 foot fences with a ballerina’s grace, break tie-out chains and slip collars so skillfully even Houdini would be amazed. An invisible electric fence by itself cannot be used for these dogs but may work well to keep certain Siberians from climbing an existing fence. Siberians will greet almost everyone, especially children, with the same unabashed joy that other dogs reserve for special family members. To this gentle breed, all men are family for they remember the Chukchi. Siberian owners respect this special relationship. Not everyone understands nor appreciates the demonstrative nature of the Siberian. The owner must keep his dog under control, for no one appreciates a big Siberian love hug when least expected or desired. Because the Siberian has such a gregarious nature, and despite its impressive strength and somewhat wolfish appearance, this people-oriented breed should never be considered for guard duty. Leave your home in the care of a “guard” Siberian and he will most likely welcome an intruder with open arms, fetch (for the first time in his life) your valuables and show him the best route of escape–after all, Siberians are great escape artists. If you intend to acquire one and only one dog, be aware of the rabbit syndrome–a rare and as yet incurable malady that affects many Siberian owners. It usually starts with the desire to own just one special Siberian, and before long, that one Siberian has turned into two, five, or fifteen special Siberians. While Siberians can thrive in a single dog environment, most prefer and many need the companionship of other animals. This extremely powerful dog is a natural athlete, thriving on vigorous exercise. The best exercise, of course, is in harness running on a team; however, your Siberian will keep in shape with twenty minutes of hard play every other day. It is a misconception that the Siberian needs lots of open space. Adequate exercise can be achieved within a fenced area no larger than the average yard. Perhaps no other breed has done more to keep his owner in shape than the Siberian. How many hearty individuals would have been willing to trek through knee deep snow with the temperature at -10 degrees F. before they owned that Siberian? Siberians must be confined or on lead at all times. Because of their great strength, they should not be left solely in the care of young children or less-than-physically-fit adults. Siberians love companionship and they will expect it regardless of the weather. If you hibernate when the thermometer falls below 40 degrees F., reconsider owning a Siberian. Few breeds are endowed with as much variety of coat and eye color as the Siberian. Match coats of velvet black, subtle gray, or the many striking hues of copper with eyes of rich chocolate brown, icy blue, or bewitching bi-color–every combination is a visual delight. As with most natural beauties, the Siberian requires a minimal amount of care to look gorgeous. Just run a comb through his coat once a week, bathe him several times a year, and the fastidious Siberian will do the rest. Because the Siberian is so desirable and gregarious, he is easy prey for dog snatchers.